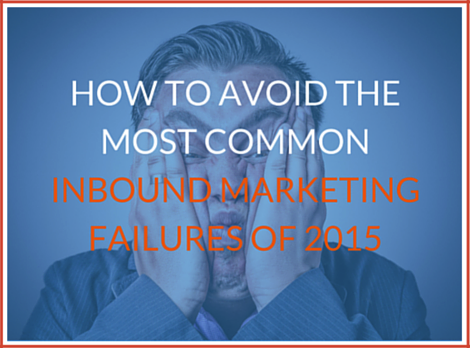 If you’re concerned that you’re not running your inbound marketing program perfectly, you’ll benefit from knowing the most common failures of 2015 and how to avoid them. This inbound marketing challenge happens when you jump into inbound marketing without being prepared for the commitment that it takes in time, energy, and resources. We’ve seen companies buy into an inbound marketing software package like HubSpot, then try to find the “autopilot” button. There isn’t one. You must still add the personal, human element required for success with any form of marketing. Allocate at least 20 hours per week to inbound marketing activities. This will include but isn’t limited to: creating new content, building new website pages, distributing and promoting content, reviewing performance, and ideating. Inbound marketing has a minimum threshold of commitment in order to get returns, but the process also gets exponentially better after reaching the basic requirements. Find your sweet spot on the curve, and don’t drag your feet while blaming inbound marketing. Even if you allocate the resources to make your inbound marketing successful, there is still another factor: waiting for your audience’s reaction. You must be patient for your efforts to start paying off. Having patience means accepting that there will be period of time where you’re putting for an effort and not receiving much (if any) confirmation that what you’re doing is paying off. The sad truth is that a huge number of companies start the inbound marketing process and quit early, even knowing in advance that the process takes time. Quitting takes away the promise of future rewards and wastes the time invested to begin with. Trust the experience and expertise of others who use inbound marketing. For nearly everyone that stayed the course through dry periods there is a sense of satisfaction that they kept faith with inbound marketing and reaped the rewards on the far end. Research consistently shows that inbound marketing increases leads within about 6-9 months. Since this is what we’ve seen from personal experience as well, you should plan to stay faithful to the process and strategy for at least that long. If you’re neglecting to use data and metrics to monitor your inbound marketing effectiveness and make adjustments over time, you’re failing to do what’s best for your company. Without feedback, you’re running your inbound marketing program by feel. There are plenty of companies that try to run things like this, using only best practices picked up from other experts. There are two main reasons you would operate like this: you haven’t committed the resources to check data, or your are overwhelmed by it. You need to know how your audience perceives your company as different from your competitors. Without presenting a clear story, message, or value proposition for your company, you’ll be less effective at attracting customers, recognition, and talent to your business. Companies that fail to show who they are and how they got there are not giving audiences anything to identify with. Your story, message, or value proposition, not your name or logo, is going to be your company’s identity. Write a 3-5 sentence statement on why your company exists, what path it is on, and what it can do that other companies will not. You will notice that a lot of your efforts will stop seeming so generic and cookie-cutter once your company defines its story. We wrote an article all about your content marketing mission statement to make this step a cinch, check it out here: "Content Marketing Mission Statements: What, Why, How….Who Cares?!" Operating without a strategy to tie your inbound marketing tactics together is a major pitfall. If you are conducting small tasks without a larger, more coordinated plan, your efforts may be wasted, contradictory, or underexploited. It really is difficult when we see a company that turns out decent email, social media, and blog efforts without uniting the work under a common banner. Without a strategy, your efforts end up going in many different directions, with the kinetic energy wasted because there is no logical “next step” to capture the audience’s enthusiasm. Create a strategy or bring someone else on to help you with it. A good strategy must be fact-based, specific, and visible. For extra points, compare metrics from before and after, then see how well your strategy paid off. Want to see what a marketing strategy looks like? Check it out here: See a sample inbound marketing strategy. When you avoid the tasks of researching, analyzing, and updating your audience information and buyer personas, your inbound marketing failure is that you are working in the wrong order. With inbound marketing, you must know who you are speaking to before you start speaking. How can you put out blogs if you don’t know who will be reading them? Every day, we see generic content that doesn’t really bother anyone, but it doesn’t grab the attention of the people it should, either. The solution is simple: just make a quick list of qualities in the type of person you want to reach. This skeleton can flesh out into a more robust persona later. List things like the style of writing your audiences prefer, the places where they look for content, and the problems they need fixed. Knowing these details should completely reshape your content. Want more information on Buyer Personas? Just click here. If you refuse to heed the wisdom, knowledge, and advice of the inbound marketing community, you are committing one of the worst inbound marketing failures. There is room for everyone to improve, but until you truly master the fundamentals, you cannot pretend to be an inbound marketing innovator. We see lots of companies that waste time charting territory that has already been mapped out. With inbound marketing, there is no need to reinvent the wheel. With so many masterful tools and processes already in place, the real creativity should be in your content and presentation. There’s nothing wrong from learning from experience, but you should allow yourself to learn from the experience of others as well. Continually educate yourself through experts and inbound marketing veterans, and don’t just stop there: implement what the experts say. You will find yourself pleasantly surprised by the positive results.